Every day, millions of people are bombarding the internet with posts from blogs that are owned by different people all over the world. Some people come up with their own blog just to have some sort of diversion. Others do it for serious business purposes. If you are one of those who are aspiring to be one of the most successful bloggers in the world, you should not miss reading the following tips. Keep in mind that most websites that you find in the internet are designed mainly for VISUAL people. This goes to say that your blog has to be visually appealing to your online visitors. Once they stumble upon your blog, the first impression that they will have is going to be about the overall design of your site. Therefore, be sure that your blog is devoid of too many in-text ads, unwanted pop-ups or advertisements all over it. If possible, ask for an advice from the experts regarding the overall design and functionality of your blog. Tip : you can ask the feedback to your visitors, via blog comments! The quality of your content should not just be high. It has to be VERY HIGH in order to standout from millions of other blogs. It is through having a very high content quality that you will be able to gain patronage. Loyal readers will just keep on coming back for more. They would even regularly check your blog for the latest posts. Your blog content should be something that is very engaging that your target readers would really take the time to read it, no matter how busy they are. Your content must provide readers an impression that if they are not going to read it they will miss a part of their life. As blog owners, see to it that you take the time to reply to your reader’s comments. It will give your readers the feeling that their comments matter a lot to you. Failure to reply to your reader’s comments will only make your comment section useless. You have to respond to them so that you can also expect the same thing from your readers. This interaction will lead to a growing network of friends who share the same interest with you. They will sooner or later turn out to be your virtual friends who will recommend your site to their circle of friends. Thus, an increasing patronage and growing number of online readers will be yours in no time. Knowing how to drive traffic from search engines into your blog will definitely set you apart from average bloggers. You should know how to link out your site to other trusted websites. Having ample knowledge regarding the use of targeted keywords, alternative text with images, meta descriptions, meta tags, etc. is crucial if you are to improve and become a successful blogger. If your blog is promoting a particular product or service, business analytics is a must for you to learn. Business analytic is one aspect of SEO that will help you as blog owner to keep track of your visitors. This way, you will have an idea as to what kinds of people are visiting your blog so you can tailor your services or products according to your online visitor’s preferences. Your blog should have a distinct personality which will add originality into it. Posts that are written from a first person point of view can be good as it gives your readers an idea who you really are. Your readers may become more interested as they appreciate the real you. However, be careful not to overdo it. Do not talk much about yourself on your blog otherwise the readers will feel that you are just trying to make a “show-off” to impress them. Remember that your readers thirst for information about anything under the sun but, not about YOU. They are after the information that you are about to share which will help them in one way or another. They do not visit your site merely for knowing more about who you really are. Do not pressure yourself to learn and master all these things at once. Give yourself enough time to become well-versed with blogging techniques. Pressuring yourself will only cause you much stress and anxiety which is counterproductive to your aims in blogging. Just keep writing, posting, learning and improving. Can you add something else? This is a very good post. It covers all aspects of blogging. Seo aspect is something that most of us bloggers do not believe in. We think it to be a technical gig and don’t worry about it. At times, bloggers think that there Content doesn’t need any support, It in itself will draw in the crowd and this is where they go wrong. If i have to put it, I will say that Seo and Content Management go hand in hand. It is imperative to see keywords readers are using or how the pattern looks like for the post you have written. Blogging is not easy but with little patience, hard work and discipline, any one can crack it. This is a very useful blog for someone who is willing to learn and grow big in this niche, very good post friend, keep it up. happy to know you liked the post. Both content and good seo is important, together with attracting natural backlinks. That’s right, for having success you need patience, hard work and determination with blogging. This is most certainly an interesting piece of writing.. Every blogger hopes to be successful on the blogosphere. Recently I have read a lot about being a successful blogger. One question I ask myself about blogging is that does being a successful blogger make one influential? I believe it depends from your point of view on “success”. I think you can reach success with blogging by making money online, but without being necessarily influential. While I know inlfuential bloggers, who do not make big revenue online. Another great question from you. I think that generally people look for good content, searching at first at popular blogs. Awesome topic indeed! I saw this article on Aha Now blog community and found interesting. “First impression is always a last impression” which is better know by everyone. But, still newbies are doing such mistakes. I agree with all the points, you have listed here. Most probably the “Sensible Intercation” part too much. You are very true here, responding to comments on time is so necessary. Thanks a lot for thsi wonderful post. Have a nice day! glad to know you are coming from Aha-Now blog community. First impression is related with concept of online reputation, or visibility. With your work on the internet, you are showing your personality. Being real and being yourself, are the most important key for me. I also love to interact with comments, I think it’s a great way to get to know your readers and more people around blogosphere. And you always provide great content to your audience. People will keep coming to your website, if you are able to write always interesting content. Thanks for your feedback,much appreciated. Yes indeed, each one of us has our own definition of success. What it may mean to me, may not mean the same for you or any third person. However, we all want to be successful, where blogging is concerned, based on how we define it. Quality content is the key factor, and as you mentioned, if you manage to write that, you have readers always coming in for more – it’s a sure mark of being a successful blogger. Having your own voice and interacting with your readers is essential, though I can understand it takes time for most bloggers to develop their own voice and even writing style. You are right about the comments and SEO too, without which your posts don’t rank and look rather empty. I think that providing good content, together with interacting with your readers and understanding their needs, is a way to reach success, with hard work and over time. I really appreciate you taking the time to visit and comment here. All the points, you have listed here are good points. . Interaction is definitely a must for a blogger’s growth. So responding to comments received in time will only help us much. Saw this post on kingged.com. Thank you for sharing.. I think that you must engage with your commenters. All of these are good tips. You hit home with the point of having a distinct personality. Because that’s what gets my attention when I read others blog. I’ve always shared my personal experience only to find out it works well in front of an audience but not so well in the blogosphere. Like you said I must remember my readers thirst for information and not information about me. I’m learning how it’s done first hand from blogs like yours. I came across your post at AhaNOW. By showing your personality, you are able to stand out from the crowd. There is not point by copying other bloggers posts, or website layout, or even writing style. By being yourself, you can then really attract people who are interested in You! Glad to know you came here from Aha-Now blog community. That were really helpful tips man, I too have written one post named: The secret of success behind successful blogger for guest post. I’ll be sure to visit your blog, after completing this comment. Erik, I liked the way you stressed the importance of personalistic branding approach. To stand out of a plethora of online blogs, today. its important to have an distinct voice in your blog. Readers want to see the REAL YOU. Is still resonating in my mind. glad you confirm my point. Showing your personality is the way to go! Be honest, be real, be You! Awesome post with these practical, helpful and relevant tips you have shared! The timing could not have been more perfect. The points are all great. However, I took careful note to first impression which as we say here locally, it is always the last impression. Hence, it’s got to be right. High quality is a must but no good if someone faithfully come to the blog and leave comment and they never get a response. I find that so rude and offensive so guess what I do personally, I do not go back. Well said the way how you dealt with sensible interaction in the post. When it comes to distinct personality, I agree that it adds originality but as you cautioned, not to overdo it. Thanks for sharing and continue to enjoy what is left of the weekend. Look forward to a great week ahead. First impression is like the last impression. I remember to have visited some blogs, and then never return back again, because of the too many ads, bad content, ugly layout, etc. When I started blogging, I was afraid to show my personality and I was even hiding my face, not displaying my picture around blogpshere. After few months, I found it counterproductive. There is no point of doing this, I thought. So I start showing the real me, and then I began to build connections and relationships. Thanks for sharing your views here, Yvonne. I always advocate to be more passionate, be more consistent and be a hard working blogger because if are successful being these you can do everything listed in this blog post. Right? Thanks for the post Erik. Writing is the major part and then comes marketing and other stuff. thanks for leaving your thoughts. You laid out a bunch of great tips here that anyone can follow if they want to be a successful blogger. The one tip I love is distinct personality. I think that is very under utilized because perhaps people are afraid to share their true selves and personality with people. All the points you stressed are top notch, my friend. Sharing this now. showing your personality can be an effective way to stand out from the millions of blogs out there. People may like you or not, but at least who follow you will be genuine fans! I’m the same as Stuart in that for a blog to keep me coming back for more I need to keep being inspired with quality content. Without that, I’ll move on and look for something else more interesting to do! I definitely think responding to comments left by readers is a must for most bloggers. That’s how blogging relationships start and develop. And of course, if you don’t have a personality in your writing, it’s going to be pretty boring. Unique quality content and writing with personality go a long way! I see your point of view, Tim. asking feedback, making connections, etc. Thanks for the tips !!! Even I too wanna become successful blogger and this tips will really help me in way of becoming a successful blogger. May I know the first impression that you’ve made smart marketers to be impressed in font of audience ? I’ve created this blog as experiment. Clean design, zero ads, pure information, useful resources, SEO basic rules. Thanks for the kind words, Siva. The tips you have given are very useful….I am also new blogger and it will definitely help me to write blogs. Blogging is proved to be promising way to make money online and one should have patience while blogging. After all it is long process and can take some time for returns from blogging. A unique and quality contents is an important factor for a successful blogging and knowledge of SEO is must there. You should promote your blogs effectively with the help of different media like social media sites Facebook.. Thanks for your feedback, Akshay. Glad to hear that, Jesse. We need to find what’s work for each of us, depending on our skills! Great post indeed! All are key points of SEO, even though we know all things, but it’s necessary to keep in mind. Content with SEO is the major role to play any website, so these kinds of knowledge are informative and impressive for us. Thanks for shared great tips and enjoyed to read! 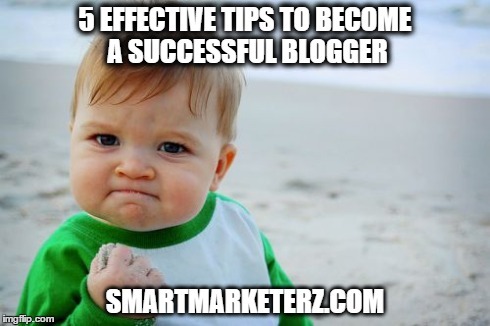 Hello Erik, I think being a life long learner and being analytical are a must when it comes to blogging. An effective blogger is open to learning – I learn something new every day even from so-called lower ranking blogs – there are educational opportunities in even the most unlikely places. An effective blogger knows that. Also, in order to create high quality content, you have to be able to analyze everything, including seemingly mundane events in daily to find meaning that can be shared in your blog posts. That’s how you keep things fresh and insightful. Your tips are great but main is quality content and SEO is most important to be a successful blogger. Very impressive post, bookmarked it. I personally believe networking is very important factor in becoming successful in blogging. I have seen many bloggers cashing their networks and becoming big names in the field within days. It is just networking. I am putting my time as much as I can invest in networking with people. According to me Off Page SEO is most important to rank any website. If we compare to on Page SEO, Normal page SEO is enough to rank your website if your Off Page SEO is Good. these tips are really helpful. I recently started blogging and was looking for something like this. Finally you told me all these tips. thanks for the help mate. Great article sir, thanks for sharing all these tips as I started blogging recently and these are very useful for me. Thanks for sharing these success tips,, I hope someday I will also become successful. Great. I started my blogging journey 3 years back, still learning a lot from people like you. I have just started blogging and I am learning a lot from you guys. Thanks a lot for this amazing post.